Peaceful and pure. This pretty arrangement of white and light colors will let anyone know they are in your thoughts. Fresh flowers such as peach roses, crème spray roses, white stock, waxflower and more are gathered in a beautiful clear vase. All items featured on this Web site represent the types of arrangements Flowers Across America offers and may vary depending upon availability in certain regions. Flowers Across America has been using the best florists since 1999! 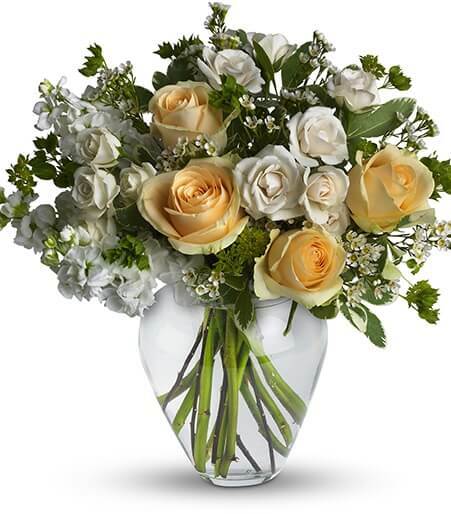 We provide nationwide delivery with high quality, trusted florists in America. Order directly with your local florist or order online with Flowers Across America, either way, you’re choosing the best florist. Flowers Across America © 2019 .